Musical Cowgirl 4 Christ: How To Make 256 Million People Happy!! 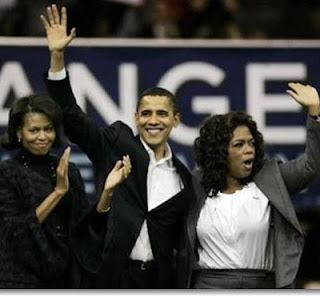 Flying on Air Force One, Obama look at Oprah, chuckled and said, "You know, I could throw a $1,000 bill out of the window right now and make somebody very happy." Michelle added, "That being the case, I could throw one hundred $10 bills out of the window and make a hundred people very happy. Hearing their exchange, the pilot rolled his eyes and said to his co-pilot, "Such big-shots back there. I could throw all three of them out of the window and make 256 million people very happy." Thought it was too funny not to share!!! So Adam and Eve are walking through the garden and Adam says to Eve. Why did God make you so beautiful but so dumb? Well, he made me beautiful so that you would love me Adam. And he made me dumb so that I'd love you. Ok, so youve probably heard it. I just like the blantant political incorrectness of it all. Blatant political incorrectness :D. That's awesome. Lisa, that's hysterical! Oh I can see the newspapers now :D. That made my day.